In just a few days time, on July 11th 2017, NASA’s Juno spacecraft will perform the closest-ever views of the swirling maelstrom known as Jupiter’s Great Red Spot. It was always hoped that the pre-planned polar orbit and close perijove passes would take the spacecraft over the storm, but the slow and somewhat unpredictable westward motion of the gigantic vortex meant that a little luck would be required. That luck comes in on Perijove 7, and we’ll be rewarded by breathtaking views – so close that the vortex will stretch from jovian horizon to jovian horizon. In preparation for that encounter, myself and others have been collaborating on an Earth-based support campaign, capturing multi-wavelength views of the jovian atmosphere to provide spatial, temporal and spectral context for Juno’s close-in encounters. Today, two of the telescopes we’ve been using released some of our imagery from May 19th 2017, acquired during Juno’s last perijove 6. These images show the Great Red Spot as it was just a few weeks ago, and prepare us for Juno’s close-in views. Both observatories are located on the peak of Mauna Kea on the Big Island of Hawaii. We have been working with the Subaru Telescope (the National Observatory of Japan) and the Gemini-North telescope. The COMICS instrument on Subaru provides mid-infrared (7-25 µm) observations that reveal the temperature structure, gaseous composition and cloud opacity within the Great Red Spot. The Subaru telescope has released an image at 8.8 µm, which primarily senses temperatures and aerosols, showing the planet’s white zones as cold and cloudy (i.e., dark) and the brown belts as warm and cloud-free (bright). The Great Red Spot can also be seen as cold and cloudy, something that we studied at length (using both Subaru data and those from ESO’s Very Large Telescope VISIR instrument) in an Icarus paper in 2010. Jupiter’s thermal emission at 8.8 µm obtained by the Subaru/COMICS instrument on May 18th 2017. A video created from a series of observations with the same settings on January 14th 2017 is also available. Credit: NAOJ and JPL. 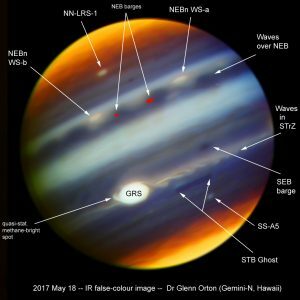 Glenn Orton was the PI of Keck exchange time to use the Subaru facilities, and said this in the press release: “During our May 2017 observations that provided real-time support for Juno’s sixth perijove, we obtained images and spectra of the Great Red Spot and its surroundings. Our observations showed that the Great Red Spot had a cold and cloudy interior increasing towards it centre, with a periphery that was warmer and clearer. This implied that winds were upwelling more vigorously towards its centre and subsiding at the periphery. A region to its northwest was unusually turbulent and chaotic…. this region is where air is heading east towards the GRS and flows around it to the north, where it encounters a stream of air flowing over it from the east.” Crucially, observations of this kind, from the VLT and from Subaru, are capable of resolving 1000-km length scales on Jupiter that are comparable to Juno’s microwave experiment, which will sound the deep atmospheric processes underlying those that we can see in this thermal image. At shorter wavelengths, the NIRI instrument on the Gemini-North observatory captured the reflected sunlight from the Great Red Spot and its surroundings, as explained in their press release. These observations required Adaptive Optics, using observations of a nearby satellite to observe and correct for the distortions caused by our own atmosphere. Orton explains: “Back in May, Gemini zoomed in on intriguing features in and around Jupiter’s Great Red Spot: including a swirling structure on the inside of the spot, a curious hook-like cloud feature on its western side and a lengthy, and a fine-structured wave extending off from its eastern side.” By observing Jupiter in a variety of different near-infrared wavelengths, which sense differing amounts of methane absorption, we’re able to reconstruct the three-dimensional cloud structure within Jupiter’s upper troposphere. Version of the Gemini-NIRI image labelled by Dr. John Rogers of the British Astronomical Association. From the Gemini press release: The colour filters cover wavelengths between 1.69 to 2.275 microns and are sensitive to pressures of 10 millibars to 2 bars. 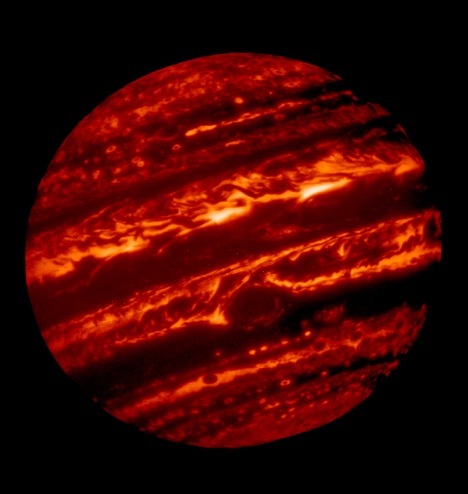 The Great Red Spot (GRS) appears as the brightest (white) region at these wavelengths, which are primarily sensitive to high-altitude clouds and hazes near and above the top of Jupiter’s convective region – revealing that the GRS is one of the highest-altitude features in Jupiter’s atmosphere. 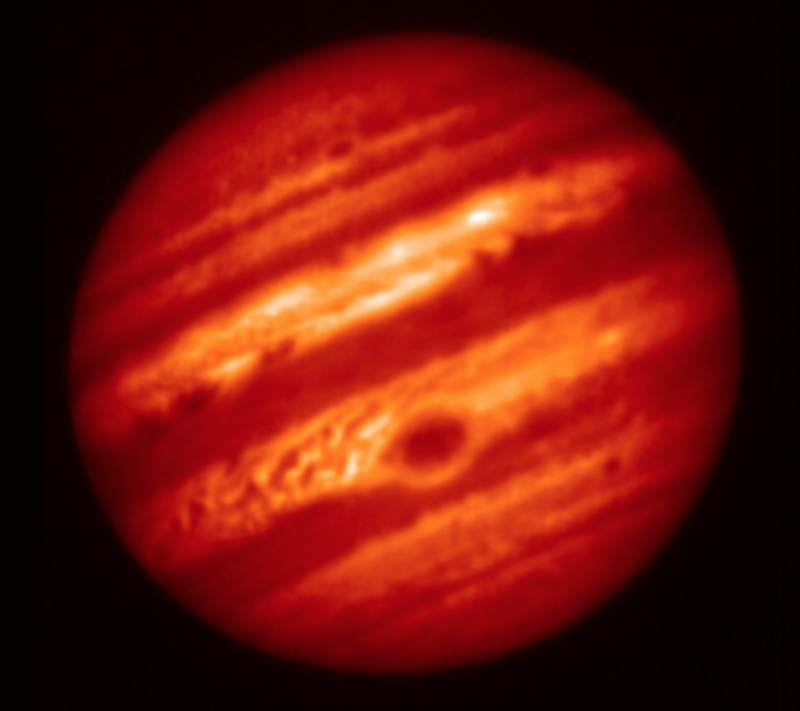 The features that appear yellow/orange at Jupiter’s poles arise from the reflection of sunlight from high-altitude hazes that are the products of auroral-related chemistry in the planet’s upper stratosphere. Narrow spiral streaks that appear to lead into it or out of it from surrounding regions probably represent atmospheric features being stretched by the intense winds within the GRS, such as the hook-like structure on its western edge (left side). Some are being swept off its eastern edge (right side) and into an extensive wave-like flow pattern; and there is even a trace of flow from its north. Other features near the GRS include the dark block and dark oval to the south and the north of the eastern flow pattern, respectively, indicating a lower density of cloud and haze particles in those locations. Both are long-lived cyclonic circulations, rotating clockwise – in the opposite direction as the counterclockwise rotation of the GRS. A prominent wave pattern is evident north of the equator, along with two bright ovals; these are anticyclones that appeared in January. Both the wave pattern and the ovals may be associated with an impressive upsurge in stormy activity that has been observed in these latitudes this year. Another bright anticyclonic oval is seen further north. Juno may pass over these ovals during its July 11 closest approach. High hazes are evident over both polar regions with much spatial structure that has never been seen quite so clearly in ground-based images, with substantial variability in their spatial structure. The central wavelengths and colors assigned to the filters are:1.69 microns (blue), 2.045 microns (cyan), 2.169 microns (green), 2.124 microns (yellow), and 2.275 microns (red). Supplementing the two investigations above, a ground-based programme is also under way to observe the deep thermal emission of Jupiter near 5 µm. We released images from ESO’s Very Large Telescope last year, and this programme has continued for each of Juno’s perijoves. A parallel Gemini programme headed by Michael Wong of the University of California, Berkeley, used an approach commonly called “lucky imaging” to obtain sharp images of Jupiter at 5 µm. Images obtained with this filter are mainly sensitive to cloud opacity (blocks light) in the pressure range of 0.5 to 3 bar. “These observations trace vertical flows that cannot be measured any other way, illuminating the weather, climate and general circulation in Jupiter’s atmosphere,” notes Wong. For the Subaru Image: Orton (Jet Propulsion Laboratory) and Yasumasa Kasaba (Yohuku University, Japan) led the team, with Takuya Gujiyoshi (Subaru Telescope astronomer) operating the telescope. Other team members included James Sinclair, Anna Payne (JPL), Joshua Fernandes (California State University, Long Beach), Leigh Fletcher (University of Leicester), Patrick Irwin (University of Oxford), Padma Yanamandra Fisher (Space Science Institute), Takao Sato (JAXA), Davide Grassi (IAPS/INAF), Shohei Aoki (IASB, Belgium), Tomoki Kimura (RIKEN), Chihiro Tao, Takeshi Kuroda (NICT)l Takeshi Sakanoi, Hajime Kita, Hiromu Nakagawa (Tohuku University), Hideo Sagawa (Kyoto Sangyo University) and Joana Bulger (Subaru Telescope). For the NIRI Image: Orton leads the observing team for the adaptive-optics imaging and Wong heads the observing team for the thermal imaging. Additional team members include Andrew Stephens (Gemini Observatory); Thomas Momary, James Sinclair (JPL); Kevin Baines (JPL, University of Wisconsin), Michael Wong, Imke de Pater (University of California, Berkeley); Patrick Irwin (University of Oxford); Leigh Fletcher (University of Leicester); Gordon Bjoraker (NASA Goddard Space Flight Center); and John Rogers (British Astronomical Association).